About a year after the launch of the first Landsat satellite in 1972, scientists began using the data to compute a normalized difference vegetation index (NDVI) which was a good proxy for photosynthetic activity. 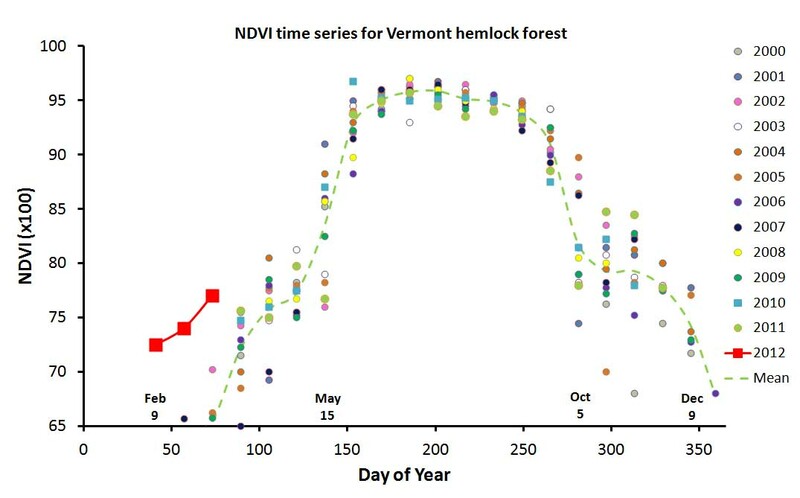 Dozens of subsequent satellites have returned data about the red and infrared light reflected from Earth’s surface, and for 40 years NDVI computed from these two bands has been a standard way of describing vegetation health or productivity. Some backers of the Balloon Mapping Kickstarter project will receive a pair of cameras which can be used to capture information similar to the red and infrared satellite data, and I have been wondering how this information can be used. One of the more common applications of NDVI data is the compilation of time series which show how photosynthetic activity changes seasonally. For example, here is an animation of 20 years of NDVI showing the seasonal green-up and browning of vegetation in Europe. Comparing the progression of green-up among years has been one of the most powerful uses of NDVI. The image of Kentucky at the top of the page is a 3 km square of horse farms and other agricultural fields near Lexington. Below is the last 11 years of NDVI data for this square from the MODIS sensor on the Terra satellite. These data are from the same 144 pixels recorded at this location every day since 2000 and summarized as 16-day averages. The striking message is that spring is coming very early this year in Kentucky. Here is a similar plot of a single pixel (250m x 250m) of hemlock forest in the mountains near my home in Vermont. Other vegetation types in Vermont are not so advanced this year because leaves are just starting to grow here, so most pixels in Vermont are not this striking. Maybe the next 16 day period will show more widespread early greening. I am not sure why the warmth this winter allowed hemlock forests to get such an early start. You can see similar data for any place in the world at the Global Agriculture Monitoring (GLAM) Project website. I am looking forward to getting some high-resolution images from the PLOTS NDVI camera pair. 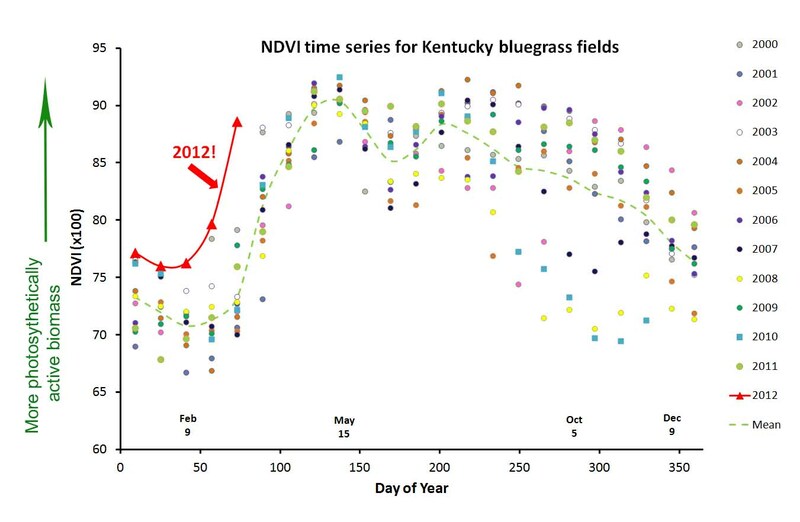 It’s too bad we haven’t already been recording the NDVI green-up during this record-breaking spring. My first NDVI images will lack the advantage of temporal comparison, so I will be looking for spatial patterns that might reveal something of interest. But I plan to try some time series as well, since they are proven crowd pleasers. Can you please help us? We would like to know how you could identify your particular pixel or say a particular area in the website. Suppose, we have a geographical area (polygon) as a shapefile , can we overlay on the website and get the graphical analysis as shown by you? We are a non-profit org working for farmers' organisation in India in providing technical advise.